Bringing objects to life in our temporary exhibitions is one of the ongoing challenges for the Exhibitions Team at the V&A Museum of Childhood. How do we make something old and lifeless seem exciting and engaging? How do we bring out the human story in an everyday object? How do we make people care? In our upcoming exhibition, A Pirate’s Life for Me, we have explored many ways of engaging our youngest visitors with objects from our collection. 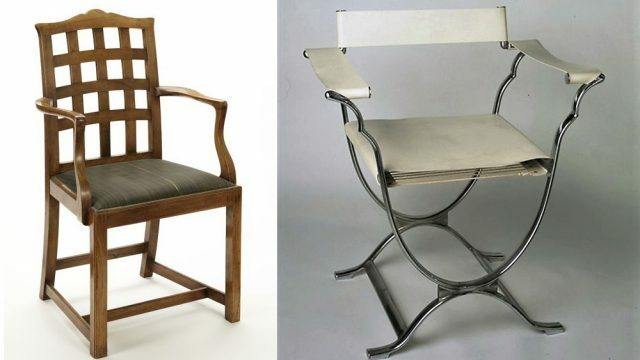 One particular object, an exercise book from the 1950s, has had a lot of time and effort spent on bringing it to life. 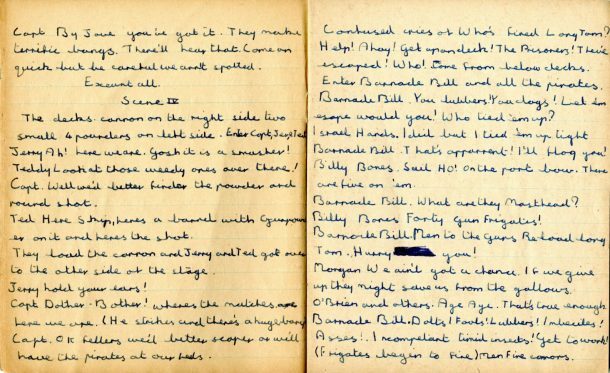 At first glance the book looks very ordinary – it was clearly used by a child and contains meticulous handwritten notes throughout. 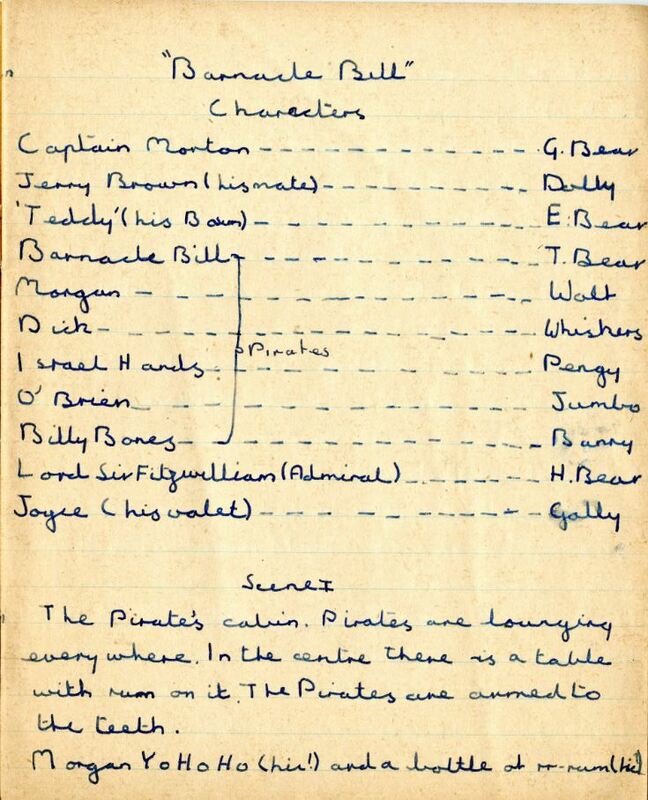 However, delve a little deeper and you find that this book contains original scripts for four plays written by a boy called David Munrow, including Barnacle Bill which is about a band of mischievous pirates. The plays are well written, contain complex stage directions and show a great deal of wit and intelligence. 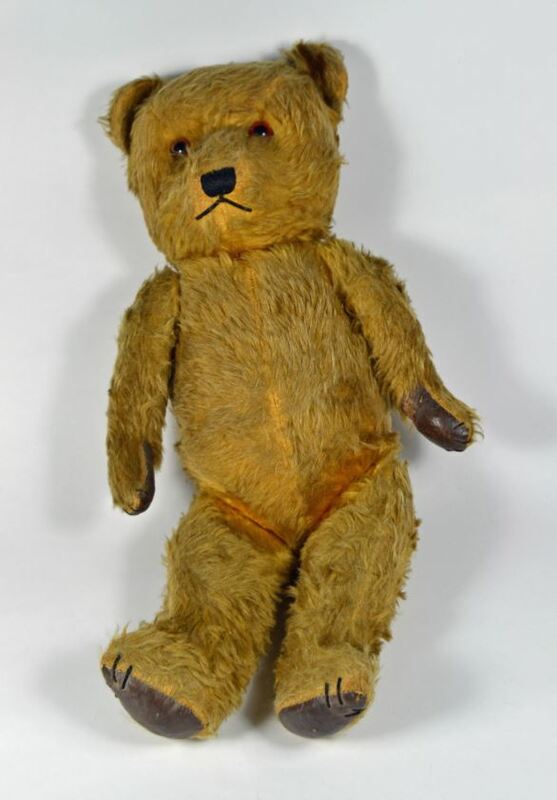 Along with the exercise book the Museum also owns other childhood objects that belonged to David Munrow, including three of his favourite teddy bears ‘Humph’, ‘Ginge’ and ‘Eddy’. David loved these bears so much that they were actually cast as the principal actors in some of the plays. If you look closely at the cast list you can spot ‘H. Bear’, ‘G. Bear’ and ‘E. Bear’. David Munrow went on to become a well-known musician and broadcaster, so it is not a surprise that his early work is so imaginative and entertaining. But how do we make a hand-written script and an inanimate teddy bear engaging for a family audience? And how do we keep the child’s voice at the heart of Barnacle Bill? We decided that the most effective way to do this was to produce the play – showing it to the audience the way it was meant to be seen, bringing David Munrow’s ideas and toys to life in the most faithful way possible. After some discussion about medium we settled on the idea of commissioning an animation, thinking that this would be the most accessible and recognisable approach for the primary audience of 2 to 8-year-olds. Having never commissioned an animation before it was difficult to know where to start, but after a bit of research we managed to get a brief together and spread the word through various networks. 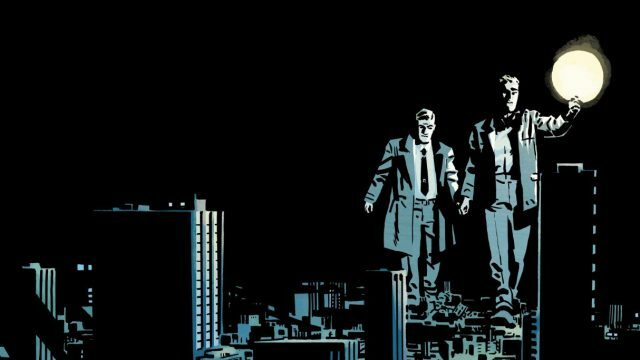 The results of this competition were staggering – we had so many submissions it took the best part of a day to go through them and whittle them down. There were simple pitches, detailed pitches, pitches which had obviously had a lot of work put into them, and pitches that made no sense at all! We ended up with a selection of submissions that the Project Team all liked for different reasons. The only logical answer to our conundrum was to let the public decide. So we took to the galleries with the different character designs and asked children to select their favourite style of animation. The most popular style of animation and character design was by Steff Lee Studios. Steff runs the family business and roped in two children, aged 9 and 11, to help her with the design process. 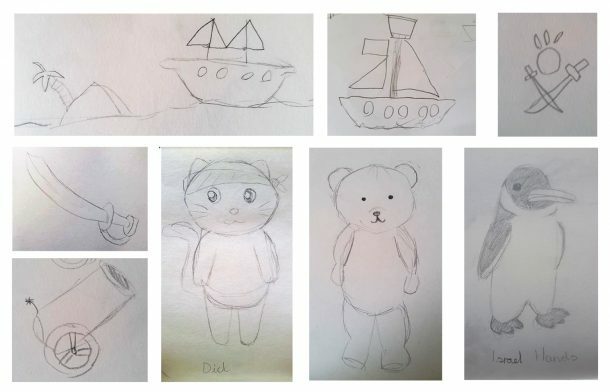 The children were asked to draw their own versions of the characters in the play, and later Steff beefed these designs up with some colour in a ‘crayon style’. This company really had put children at the very heart of the project – we loved that, and thought it was a very fitting tribute to David Munrow’s play. The final addition to the animation was to give the character’s voices. We realised quite quickly that there was no other option than getting some children to read out the character’s lines. Luckily a member of the Project Team was happy to lend us her children, and to provide a recording studio, Tonic Sound. After spending a very warm day in a small studio with a handful of enthusiastic youngsters we finally had the last piece of the puzzle. The children read brilliantly, and even contributed to the sound effects with some realistic ‘splashes’ and ‘bangs’ thrown into the mix. Now all that is left to do is wait for the animators to add some finishing touches and bring it all together! There you have it! A pirate play written by a child in the 1950s, animated in 2018 using different children’s drawings to inspire the characters, then voiced by other children, only to be viewed by many more. 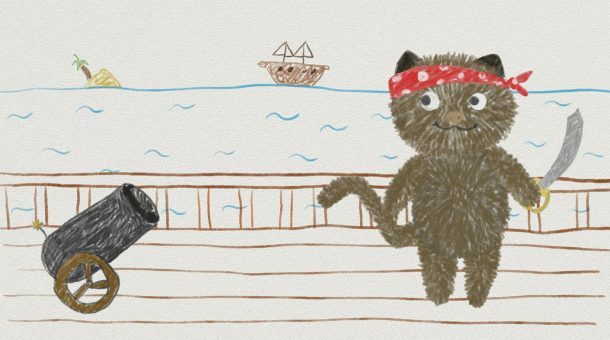 You can see the animation, teddy bear and original script on display in our exhibition, A Pirates Life for Me, from 20 October 2018.